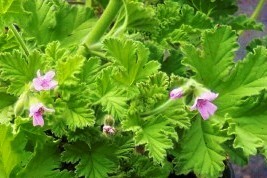 Attar Rose Scented Geranium (p. capitatum) - Leaves have a strong rose fragrance. Excellent potpourri material. Small pink flowers when in bloom. Large ranging plant. Traditionally used by the perfume and cosmetic industry for scented soaps and perfumes. Culinary and tea use. Perennial zones 10-11+ Live starter plant in 3 inch container. I purchased 3 Attar of Rose Scented Geraniums last year and planted them in pots. They are fast growing (but not vigorous at all) and branch out quite a bit, so I ended up planting them in the ground later in the season. But, up by the doorway, I would brush past as I came and went, and these plants would release the most gorgeous rose fragrance. I just loved it! I also added the blossoms to teas and Hawaiian martinis to add beauty and aroma. The leaves and blossoms are edible and can also be baked into muffins or cakes. I purchased 3 more plants this year. This is just one of my absolute favorites, and Colonial Creek really has the best plants around - health and shipped in great condition. Nice, big starter plant! Much better than I have gotten through the mail elsewhere. Excellent service, will definitely buy from Colonial Creek again!